Twitter introduced Lists about a year and a half ago. When first introduced on twitter.com, Lists were shown in a drop-down menu on the profile page. 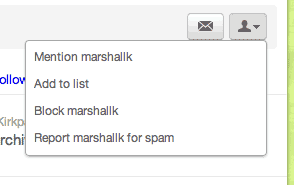 You could select the dropdown and check off whichever of your lists you'd like to add them to. Some time in the last several days this changed. Lists have moved one level deep in menus. Selecting "Add to list" brings up a floating window of checkboxes where list memberships can be changed. Presumably this means a relatively small percentage of Twitter users made use of the Lists feature, as removing the dedicated icon declutters the UI. Its too bad that use of Lists was not more widespread. Akin to anchor text for web pages, the names of Lists to which one has been added to are an independent signal of the content and quality of an account.